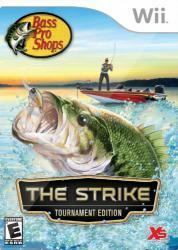 The Strike literally puts the fishing rod in players� hands as they head out to their favorite hot spots, including several popular lakes in North America. By combining high-quality, realistic game play, The Strike is quite the catch for gamers and outdoor enthusiasts alike. Tournament Fishing and The Bass Pro Invitational: In Career Mode gamers will need to understand the equipment, topography of the lakes, and specific fish behaviors in order to succeed. Players will be guided by the true rules of tournament bass fishing just like they would if they were fishing in real life.